Salina Central boys basketball coach Doug Finch has seen his team shift into neutral after grabbing leads. This time, the car broke down. Newton received 14 gigantic points from sophomore Jaxon Brackeen off the bench, the Railers made 25 of their 27 free throw attempts, and Newton overcame a 15-point deficit to edge Salina Central in overtime, 65-56. 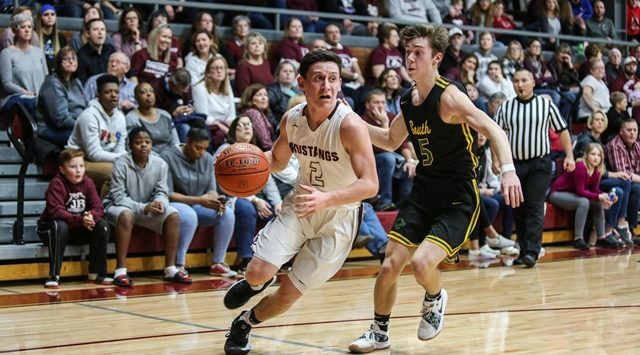 Central (10-3, 3-3 AVCTL-I) started hot from the field, connecting on five threes, four combined by David and Mark Grammer as the Mustangs build a 17-8 cushion after one. The Mustangs cooled off in the second quarter, but still held the Railer in check, leading 26-17 at halftime. The Mustangs threatened to sprint away in the third, getting back-to-back triples from senior Brogen Richardson, pushing the advantage out to 36-21 with 3:18 left in the third period. That’s when the tide turned. After trimming the margin to eight, Newton (7-6, 4-3) grabbed its first lead, 46-44, with under 1:30 to play off a running bucket by Brackeen. The sophomore seconds later drilled a monster trey from the left corner. With 16 seconds remaining and a 49-48 cushion, junior Ty Berry approached the free throw line after being fouled. The college basketball prospect missed the first, but hit the second. Central flew the other way and senior Harper Williams banked in a scoop shot as time expired to push the game into overtime. Central did lead by two in the extra period, but Brackeen was dared to make another three from the same spot as his first, and he splashed the shot, putting the Railers up for good. Berry was held to just 13 points on two made buckets, but helping Brackeen was senior Damarius Peterson, who poured in 22 points, nailing all 10 of his free throws. Salina Central was paced by Williams’ 18 points. Senior Mark Grammer added 15 points, hitting four threes in the first half. Up next for Salina Central is a home showdown with Campus. Pregame at 5:45 on Sports Radio 1150 KSAL. Much like the boys, Newton relied on a strong second half. Both teams locked in defensively, settling with a 20-all stalemate at the break. Salina Central (7-6, 3-3 AVCTL-I) did have the biggest lead of the first half at five points, but the Railers took control in the third quarter. Central trailed by five in the frame before crawling to within two after a triple by freshman Aubrie Kierscht. Newton (7-7, 4-3) ran the other way, and received a last-second triple by senior Megan Bartel to hold the advantage at five. Newton used that three to spark an 8-3 spurt that ended the game for good. Bartel finished with 15 points while leading scorer Desiray Kernal ended up with 12 points on one made bucket. Kierscht and freshman Hampton Williams provided 12 points each, but it was junior Kadyn Cobb that led the Mustangs. Cobb hit six triples, giving her a new career-high of 20 points.